Hey hockey fans! 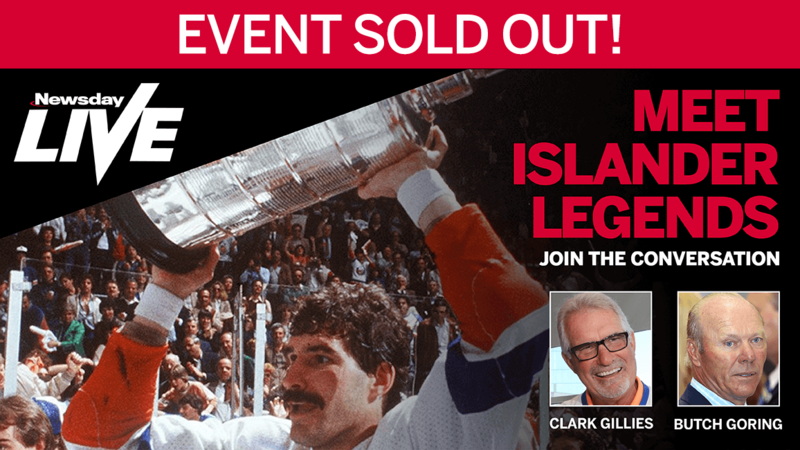 Relive the 1980s New York Islanders dynasty during an exclusive meet and greet and discussion with legends Clark Gillies and Butch Goring. Plus, take part in an in-depth talk on the future of the franchise with sports writers Andrew Gross, Laura Albanese and Colin Stephenson. Autographs, Photo Ops Available*. No personal items. $5 of each ticket sale benefits Newsday Charities. No refunds/exchanges. Other restrictions apply. See Ticket Terms for details: newsday.com/hockeytalkeventterms. The holder of this ticket consents to the use, at any time in any medium, of his or her likeness in any photographic or video depiction made in or about the event by or on behalf of Newsday Media Group. Tickets will not be available at the door. *Autographs will be limited to photographs of the players and will be provided to all attendees at the event.